NASA’ New Horizons spacecraft is a mere one million kilometres away from Pluto, as it approaches the dwarf planet and its moon Charon for the historic flyby tomorrow, it’s constantly sending back images to earth, and the last one is the sharpest and most stunning image yet of the mysterious icy world. On July 11, 2015, the probe captured this spectacular image, which suggests some geological details of both Pluto and its largest moon Charon. The photo was taken by the on-board Long Range Reconnaissance Imager (LORRI) from a distance of about 3.9 million kilometers (2.4 million miles ) and its clear and sharp enough to made the team excited. 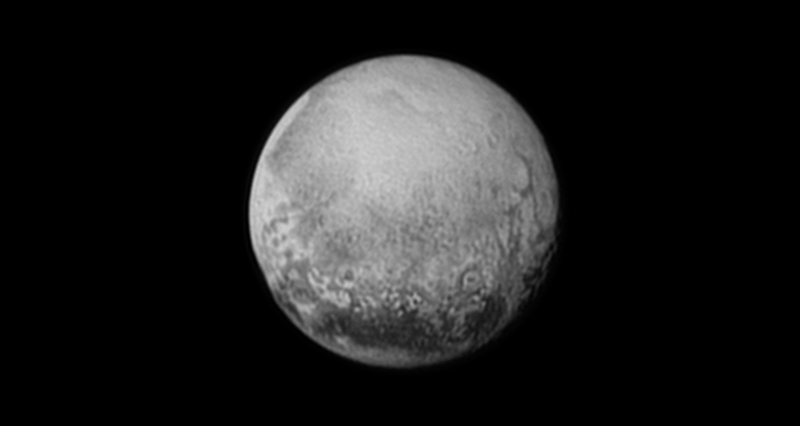 We’re close enough now that we’re just starting to see Pluto’s geology, it’s a unique transition region with a lot of dynamic processes interacting, which makes it of particular scientific interest. 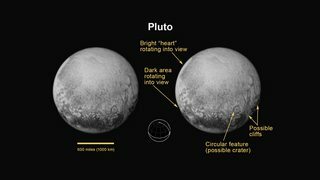 Based on these images, astronomers start identifying traces of Pluto’ geology like some linear features, sharp terrain drops and surface details, features that could be cliffs or even an impact crater. 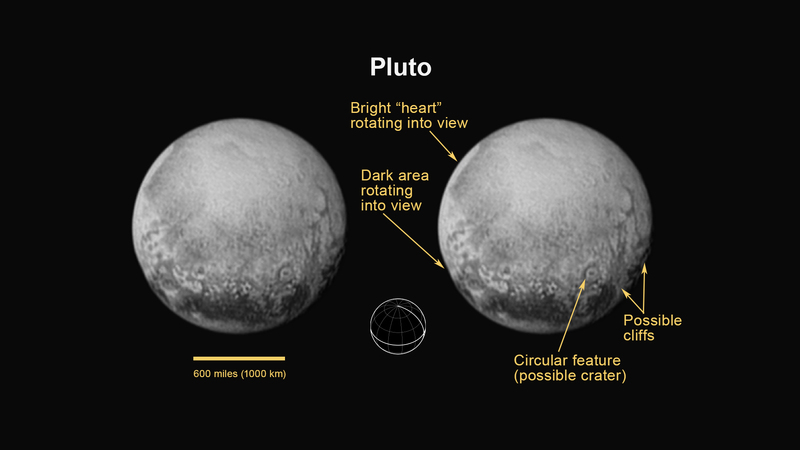 Meanwhile, Pluto’s largest moon, Charon, is revealing itself as a world of chasms and craters. The most pronounced gash, located in the southern hemisphere, is longer and miles deeper than Earth’s Grand Canyon, according to William McKinnon. New Horizons has transformed our view of this distant moon from a nearly featureless ball of ice to a world displaying all kinds of geologic activity.